Andrew has responsibility for the operational management of the Finance Office including the Departmental Services Team, Group Accounting, Financial Control and Treasury and the Purchasing and Insurance Office. He is the Secretary to Finance & General Purposes Committee and is responsible for the preparation of the University’s financial plan, statutory accounts and management accounts. Andrew originally joined the University in 1994 as a management accountant and subsequently held a variety of posts in the University’s Finance Office until 2004. After two years working as a Finance Director in the Further Education sector he returned to Warwick in the post of Deputy Finance Director (Group Accounting). 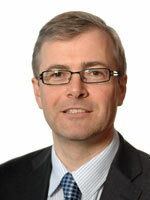 He was appointed to the post of University Finance Director in July 2011. Prior to his time at Warwick, Andrew worked as an auditor at Ernst and Young during which time he qualified as a Chartered Accountant. He has also worked in the NHS sector. Andrew is a graduate of the University of Birmingham.